BLACK ARROW NOWHERE BOUND JACKET - Available from VBS Co.
Usually ships within 24hours. If we do not have your size or colour option let us know and we can order. If we do not have your size or colour option let us know and we can order. Keeping it street cool is the women's Nowhere Bound motorcycle jacket made from 12oz 100% cotton denim. 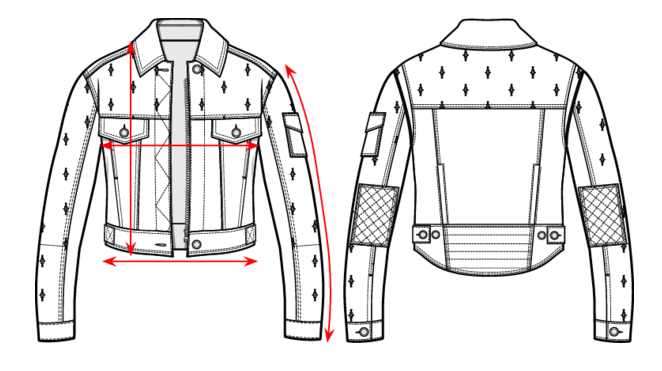 A check cotton lining keeps the jacket soft and comfortable. The back features some discreet air vent zippers for when the weather is warm quilted elbow patches for added strength and multiple pockets! Includes Dupont Kevlar® lining panels and CE approved armour for protection. We are the only NZ retailer stocking Black Arrow Label. The quality and styling of these jackets has exceeded our expectation. We can also order in any size or any other Black Arrow Label product you are after if we don't have it in stock. *All measurements are taken as flat garment measurements. Sizing may vary due to manufacturing tolerances.